NDdeP belongs to us all. My heart bleeds for my French friends. French billionaires Arnault and Pinault are now falling over each other with promises of hundreds of millions for the rebuild. It will be a major undertaking, but the French have a history of getting that right and have a really great approach to heritage. A recent example is the restoration of the Parlement de Bretagne in Rennes after the fire during the fishermen’s protest in the mid 1990’s. The Paris fire service (Brigade de sapeurs-pompiers de Paris) was created in 1811 after a major fire during a ball at the Austrian Embassy. During the Commune (1871) the Louvre, the Hotel de Ville, the Palais Royal and the Palais de Justice, - to name a few - were destroyed in riots. Another, later on was the Opera Comique (Salle Favart). All restored. The biggest ‘restoration rebuild’ I can think of is that of the ‘Old Town’ in Warsaw after WW2 – a story in itself, workers being bussed in, fed for labour, buildings recreated from old paintings and house plans drawn by architectural students during the interwar period that were buried during WW2 and dug up afterwards. 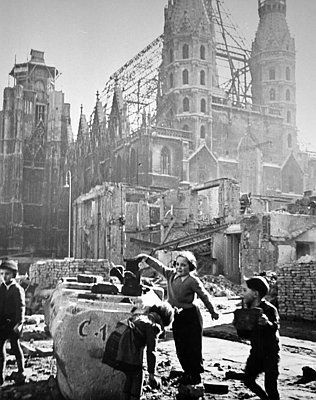 The Royal Air Force and US 8th AAF destroyed the medieval and baroque centre of Dresden in February 1945, including the renaissance/baroque Frauenkirche. When I saw the rubble for the first time in 1982, it was hard to believe that anything could be restored. Yet now it is almost as though the appalling events of 1945 have never happened. In WWI the Germans bombarded Reims Cathedral causing huge damage. After the war it was rebuilt largely thanks to funds provided by John D Rockefeller. The oak beams were replaced by reinforced concrete/ferrocement. If Macron's five-year time-frame is to be met that will have to be done with NDdP - I wonder how that fits with the outlook of the heritage people? Also , will there be a debate on building a second spire? In the French press today there is much talk of the design of the replacement spire structure. I'm not sure I like that Macron is putting a time frame on it. With literally hundred's of millions of Euro being pledged this seems like a real opportunity to secure the buildings heritage for the next thousand years, so I would hope the focus would be on doing things properly, however long it takes. Last edited by Hermy; Today at 21:21.